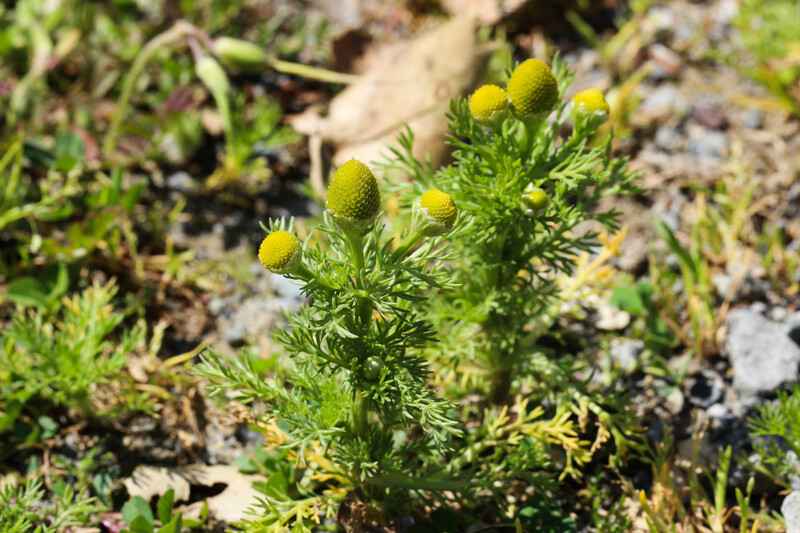 Pineapple weed (Matricaria discoidea) is an unobtrusive plant; it grows up through cracks in the sidewalk, or along hard-packed roadsides. In general the small plants are between 4 and 11 inches tall, with feathered leaves. The composite flower heads look like small yellow-green pincushions, earning the name. This is a native to both northwestern North America and northeastern Asia. thanks! this plant appeared in a photo I took. CalFlora: The name says it all. Search by name, county, plant type, and more. What Grows Here: A great search tool for what is in your zip code, watershed, etc. Jepson eFlora: The best technical botanical descriptions around of California plants. Native American Ethnobotany Database: summaries of the traditional uses of the plants of North America. Forest Service ecology database: A WEALTH of information--from habitat to human and wildlife uses to effects on livestock. Plants For a Future: This database of edible and useful plants is searchable in all kinds of ways (eg, species that taste like chocolate) and summarizes info on collection, use and cultivation. PLANTS database: like CalFlora but nationwide. Offers little information beyond range and botanical description. California Natural Diversity Database: The searchable authority on rare and endangered species. California Native Plant Society, Marin Chapter: The go-to experts on local plants. Join up, have fun, geek out. California Invasive Plant Council: Learn more about the bad guys. Bay Area Early Detection Network: Report invasive species here. The California Lichen Society: Need we say more? Consortium of North American lichen herbaria: Searchable databases from a whole slew of herbaria. Awesome! Unless otherwise indicated, all photos on this website are under copyright to Jacoba Charles. Please do not use them without permission. All material on this site (such as which plants are edible and which are poisonous, for example) is for informational purposes only. Please double-check all identifications with a reliable and peer-reviewed source before using them for something important where an incorrect ID could get you in trouble - such as for academic research, or for eating.